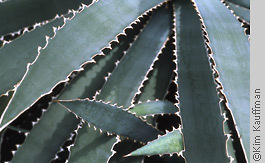 Garden photography, horticultural photos, botanical photography - by any name this genre includes flower photos, images of plants and garden scenes for editorial and advertising. 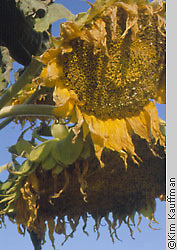 To view Kim's fine art botanical photographs go to oursister site Synecdochestudio.com and see the Florilegium portfolios. 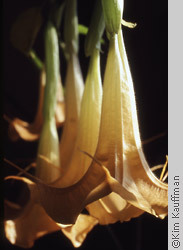 The fabulously fragrant flowers of Brugmansia 'Charles Grimaldi'. 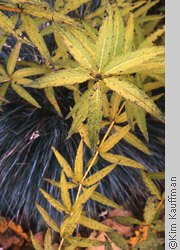 Fall colors of Veronicastrum virginiana and Festuca 'Elijah Blue'. 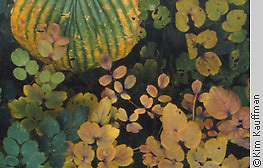 Fall leaf colors and texture in shade garden plants Hosta, Thalictrum and Dicentra. 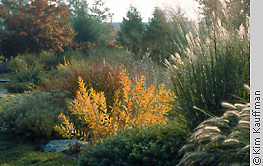 Fall colors in Michigan State University perennial gardens. 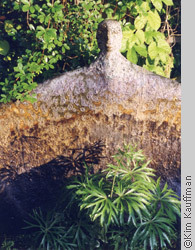 "Four Directions" sculpture by Mark Chatterley surrounded by Akebia quinata and Humulus vines with Syneilesis aconitifolia in foreground. 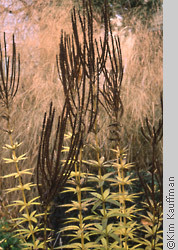 Autumn view of Veronicastrum virginiana flowers and foliage against haze of Panicum. 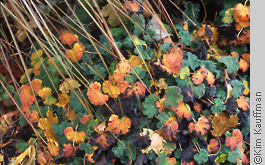 Fall foliage colors of Geranium renardii. 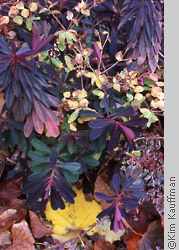 Autumnal color medley: Euphorbia foliage and flowers, Cotoneaster, Maple. 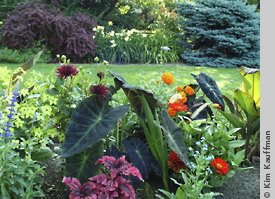 The summer annual border at Gardens in Lansing, MI featuring Colocasia, Zinnias, Dahlias, Salvia. 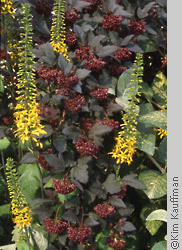 Ligularia 'The Rocket' blooms intertwine with foliage and flowers of Physocarpus 'Diablo'. 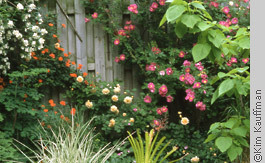 June garden featuring Roses 'Warm Welcome', 'Buff Beauty', 'William Baffin', Mock orange blooms and yellow Catalpa. 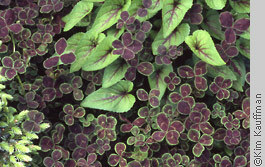 Foliage color echoes manifested in Viola 'Mars' and maroon leaves of Oxalis. 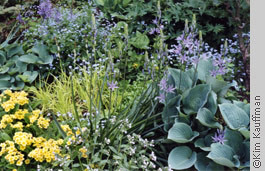 Spring garden with Camassia and Primula blooms, Hostas, Carex 'Bowles Golden' grass. 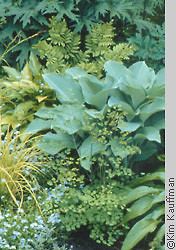 Shade garden medley: Hosta 'Krossa Regal', Thalictrum dipterocarpum, Carex elata 'Bowles Golden' Ligularia przewalskii, Osmunda regalis (royal fern) and blue flowering forget-me-not Myosotis sylvatica.